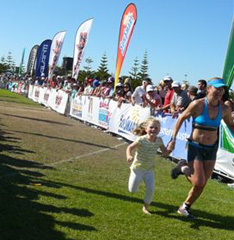 Caroline conquers Busselton Half Ironman! The venue was beautiful Busselton, south of Perth in Western Australia. 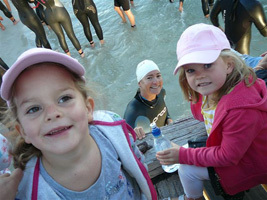 The date was Saturday 4th May 2009, where Caroline, Daughter No.4, was about to perform her first Half Ironman. 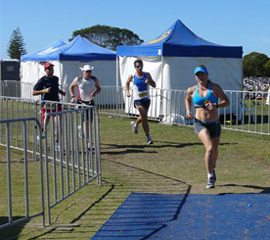 The preparation for this event involved the usual self-discipline and training that is required for such endurance events, however the circumstances differed for Caroline. 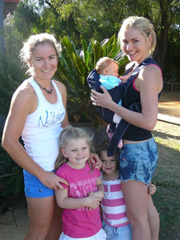 Caroline lives on an isolated farm, four hours north of Perth, with her little family where she trained daily mostly by herself or with the male staff who worked on the farm. The local swimming pool at Enneabba remained open especially for her until the event so she could complete her twice weekly training. 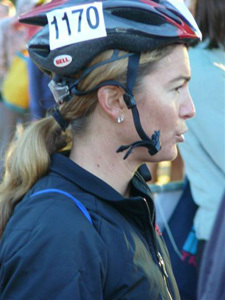 Her coaching was by “distance education” with experienced and well-respected world ironman Alice McClure – Caroline’s older sister. 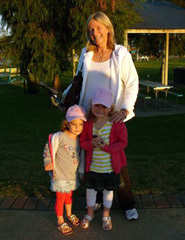 At school, both girls were fiercely competitive and highly successful – Caroline’s determination to succeed and perform at an elite level has flowed on from her school days. 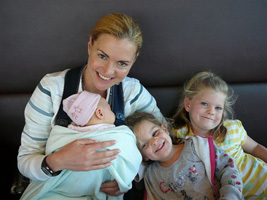 Gracie arrives to cheer on Caroline, and Charli & Lilli are introduced to brand new cousin Amelia. 21km run in 1hr 34mins. Her run was phenomenal – second in her age group and 8 out of the total of 330 girls – and still looked like she had energy to spare at the end! Coach Alice McClure was very proud and amazed at her performance. 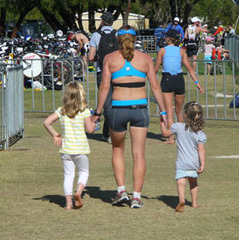 Spectators – Mum Janie, and Sister Gracie with new baby Amelia – flew from Melbourne to watch Caroline in her first Half Ironman, and had a fun day with Charli and Lilli cheering on their heroine & Ironmum! Ooo, Mummy won’t be laughing once the race gets going! Caroline knows that prior planning & preparation prevents……..bad stuff happening. Grabbing breakfast during the bike leg – cheering takes a lot of energy, y’ know! Good ol “Danie” is always there for support! 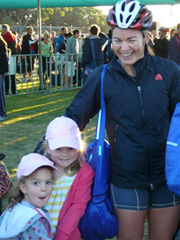 Mum may be the Champ but Charli still picks out the photo-op before she does! 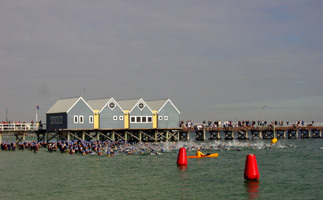 This entry was posted in Health, Fitness & Spirit and tagged Busselton, Caroline Ashby, ironman, triathlon on May 4, 2009 by ruralorg.